Imperial Guard platoons are made up of several squads of guardsmen. The massive firepower of the combined squads makes them a deadly opponent, capable of outshooting almost anything. A squad consists of 10 Guardsmen. 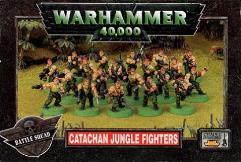 This box contains 20 plastic Catachan Jungle Fighters armed with lasguns. The box also contains 4 Flamers, 4 Vox-casters, 24 Lasguns, 4 laspistols and 12 close combat weapons (swords & knives).